One of the most challenging situations facing practitioners who work with pain and injury conditions is correctly interpreting nerve injury symptoms. It seems that in so many massage therapy training programs the nervous system gets only cursory attention, yet pain originating in the nervous system is a critical factor that drives people to our practices. The key to understanding nerve injury lies in a solid grounding of the structure and function of these crucial nerve tissues throughout the body. Let’s explore these tissues moving from the center out to the periphery and how various injuries or dysfunctions affects these tissues. The brain and spinal cord make up the central nervous system. The nerves which exit the spinal cord and permeate the entire body make up the peripheral nervous system. It is the peripheral nervous system which is of greatest concern to massage therapists as the cause for many pain complaints. There are two sets of nerve fibers that connect with the spinal cord on each side. Fibers from the dorsal root enter the spinal cord toward the posterior side, while fibers in the ventral root exit the spinal cord on their way to the periphery (Image 1). The dorsal nerve root contains sensory fibers bringing all the body’s sensory information back to the spinal cord on the way to the brain. The ventral roots contain motor fibers for sending signals from the central nervous system out to various target tissues such as the muscles. Just distal to the spinal cord the nerve fibers bundled within the dorsal root and the ventral root join together encased in a single bundle. This bundle is generally referred to as the nerve root at that particular spinal level. 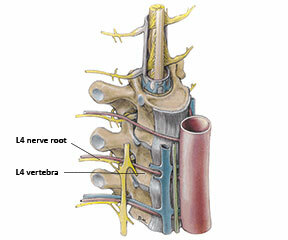 For example, the nerve root that exits just below the L4 lumbar vertebrae is referred to as the L4 nerve root (Image 2). Moving distally, nerve roots join with fibers from other nearby nerve roots. 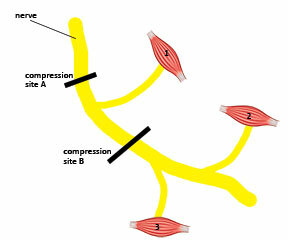 At this level the connection of nerve fibers is referred to as a plexus (Image 3). There are four major nerve plexuses with nerve roots that exit the spinal cord. The most superior is the cervical plexus. It is composed of nerve roots from the C1 to C4 level. The nerves that form out of the cervical plexus remain in the cranium and cervical region. 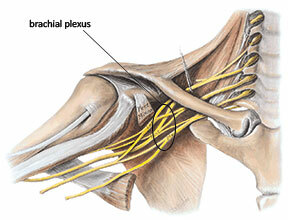 Nerve roots in the C5 to T1 level make up the brachial plexus. Nerves that eventually form out of the brachial plexus contain branches that terminate in the neck, shoulder or extend down the entire length of the upper extremity. The brachial plexus is routinely involved in various pain and injury conditions because it is easily exposed to adverse forces due to its location in the neck. The nerve roots in the thoracic region don’t blend together to form a plexus, but simply innervate local muscles and other tissues in the area. The remaining two plexuses are in the lumbar and sacral areas. The lumbar plexus has contributions from the T12 nerve root and the first four lumbar vertebrae (L1-L4). Fibers from the lumbar plexus have sensory innervation to regions of the pelvis and thigh and motor branches which focus on pelvic and thigh muscles. The sacral plexus has nerve fibers that emerge from lumbar and sacral nerve roots from L4-S4. Fibers from the sacral plexus innervate the pelvic region, but also emerge to form the body’s largest nerve, the sciatic nerve, which runs the entire length of the lower extremity and has terminal branches all the way into the plantar surface of the foot and toes. One of the more fascinating aspects of nerve fibers that many don’t realize is that individual nerve cells run the entire length of the nerve. That means that for the nerve fibers within the sciatic nerve that eventually go into the foot, there are individual cells extending from the spinal cord all the way to the foot. These are exceptionally long cells! The importance of these long nerve cells and how they relate to various pain complaints is illustrated by impairment of axoplasmic flow, which is discussed below. Most of these major nerve trunks carry both motor and sensory fibers and are referred to as mixed nerves. 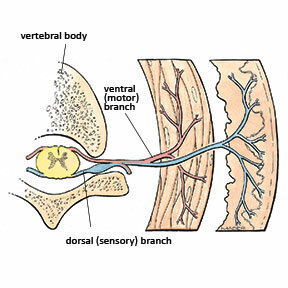 Some smaller peripheral nerves may carry exclusively motor or exclusively sensory fibers. A peripheral nerve has fibers that originate from multiple nerve roots. Similarly, fibers from one single nerve root may blend into and terminate in different peripheral nerves. Having fibers from different nerve roots within a peripheral nerve reduces the likelihood of complete nerve dysfunction if a single nerve root is injured or damaged. However, it also makes identifying certain types of nerve injury more challenging for the clinician. There are two terms that are used to describe nerve injuries and which indicate the location of the pathology. The first is radiculopathy, which is a nerve pathology that occurs at the nerve root level. A common radiculopathy is the herniated nucleus pulposus (HNP) or herniated disc, in which the disc presses on the nerve root. Earlier we noted that nerve roots contain fibers that eventually make up different peripheral nerves. Therefore pressure on a nerve root can affect fibers that make up more than one peripheral nerve. Consequently, pressure on a single nerve root can produce sensory symptoms along a wide area of the extremity. The area of skin supplied by fibers from a single nerve root is referred to as that nerve root’s dermatome (Image 4). A radiculopathy or nerve root dysfunction can produce symptoms anywhere along that nerve root’s dermatome. Farther along its length each individual peripheral nerve innervates a particular region of skin with its sensory fibers. The region of skin innervated by fibers from a single peripheral nerve is referred to as that nerve’s cutaneous innervation. The cutaneous innervation for a particular nerve is always smaller than a dermatome because the dermatome includes fiber innervation from other nerve roots as well. A good comparison is to look at the C8 dermatome which extends the length of the upper extremity and compare that with the cutaneous innervation of the ulnar nerve. 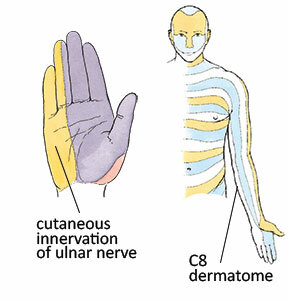 Cutaneous innervation of the ulnar nerve is only on the ulnar aspect of the hand but does not include the medial aspect of the forearm or upper arm that is included in the entire C8 dermatome (Image 5). 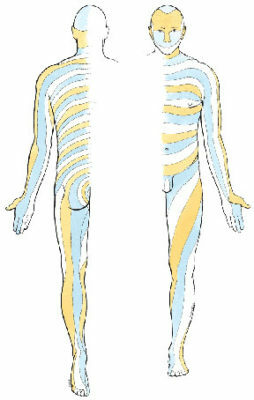 There can be some variation in these dermatome locations so maps may differ slightly. A single nerve root has fibers that blend into different peripheral motor nerves. The group of muscles supplied by fibers from a single nerve root is referred to as a myotome. If a nerve root is being compressed, weakness or atrophy in any of the muscles that have fibers supplied from that nerve root (the nerve root myotome) could exist. Recognizing dermatome or myotome symptom patterns is a key facet of locating a site of peripheral nerve injury. The second key term of nerve injury is peripheral neuropathy. Pathology farther along the length of the nerve is called a neuropathy. Neuropathy literally means damage to or disease affecting the nerves. It is also called a peripheral neuropathy indicating that the injury is in the peripheral nerves, distant from the nerve roots and spinal cord. Many nerve compression syndromes, such as thoracic outlet and carpal tunnel syndromes, are examples of peripheral neuropathies. Both motor and sensory symptoms can occur from peripheral neuropathy. In some cases the symptom pattern may give an indication of the severity of the injury. For example, there is a greater percentage of sensory fibers in the distal median nerve compared to motor fibers. That is why people who develop carpal tunnel syndrome tend to develop sensory symptoms first. If motor symptoms (weakness with grip strength) are present, this indicates a greater degree of nerve injury because more fibers (including more motor fibers) are affected. Peripheral neuropathies also produce motor symptoms. If the motor nerve root fibers are being compressed, weakness or atrophy of the muscles being supplied by that nerve will result. The location of nerve entrapment or impairment has a direct bearing on which muscles will be affected. The more proximal is a nerve compression pathology, the greater number of muscles that will be affected. For example, there are three muscles innervated by the same nerve indicated in image 6. If compression is occurring at Location A, all three muscles could be affected with weakness or atrophy. If compression is occurring at Location B, weakness or atrophy would only be expected in muscles two and three. Knowledge of common nerve entrapment sites is therefore crucial to knowing what type of symptoms should be expected. If a nerve compression is more proximal, there is a greater likelihood that more motor and sensory regions would be impacted. The more distal is the site of nerve compression the fewer motor or sensory fibers will be affected. Knowing when a nerve is purely motor or purely sensory is also very helpful because the pathology may produce only motor or only sensory symptoms because the affected nerve is not a mixed nerve. Nerve injury can occur from either compression or tension (pulling force on the nerve). Compression injuries are more common and make up the large majority of peripheral neuropathies that you hear about, such as carpal tunnel syndrome or thoracic outlet syndrome. Nerve injuries generally develop from compressive loads, such as a direct blow to the nerve or a chronic lower level compression. Tension injuries on nerves don’t receive as much attention as compression injuries yet are increasingly recognized as a likely cause of many nerve-related symptoms. With excess tensile stress the overall diameter of the nerve decreases thereby compressing the fibers within the nerve; this condition is called adverse neural tension. Recognizing the biomechanical forces of compression or tension on nerves helps determine how they may be involved in various clinical presentations. Pathological changes also develop in the nerve if there is a double or multiple crush phenomenon. Multiple crush describes a situation where there is more than one site of nerve compression. With more than one site of compression along the nerve, symptoms are often magnified due to the multiple sites of impairment. The best analogy to understand the multiple crush is to think of the nerve like a hose with water flowing through it. Step on that hose somewhere along its length and the water flow at the other end will be decreased. If you step on it in a second location the water flow is decreased even further. Nerves are responsible for transmitting their own nutrient proteins throughout the entire length of the nerve. They transmit these nutrient substances through a continuous flow of axoplasm (cytoplasm of the nerve axon) within the nerve cells. Remember that nerve cells extend the entire length of the nerve fiber they are located within. With an impairment in the axoplasmic flow, distal nerve tissue is nutritionally deprived and therefore it becomes symptomatic causing symptoms such as paresthesia, numbness, or burning sensations. Nerve tissue ischemia from impairment of blood flow to the nerve can also produce these symptoms. The multiple crush phenomenon is also a common cause for clinical confusion and improper treatment. Treatment may be directed at a distal nerve compression pathology (like carpal tunnel syndrome) assuming it is a localized disorder. Failure to recognize more proximal nerve compression that exists simultaneously could mean that symptoms perpetuate even after treatment. The multiple crush phenomenon is a likely explanation for why so many carpal tunnel treatments are unsuccessful. The pressing question for massage therapists is what role we can play in addressing nerve compression and tension pathologies. When muscles become dysfunctional with tightness or myofascial trigger points our primary treatment strategy is to decrease their tightness and improve function. Pressure and gliding movements applied directly to dysfunctional muscles are effective in producing beneficial therapeutic changes. The strategy for addressing symptoms of nerve compression or tension pathology are quite different. Nerve tissue will be further aggravated if it is compressed or stretched when already injured. However, that does not mean massage is not an effective treatment. The first order of treatment is to prevent any additional irritation of the nerve and this is where massage plays such an effective role. In many instances compression of the nerve is caused by tight or restricting local soft tissues. Massage is very effective in reducing tightness of these tissues that may be compressing the nerve. When pressure is relieved from the nerve, the natural healing process can proceed and the nerve can regain its optimal function. Massage therapy treatment for nerve-related disorders is most effective when the practitioner can identify the most likely site of pathology. Treatment can then be aimed at the local tissues that are contributing to the dysfunction. However, caution in treating these areas is imperative because working on them without adequate knowledge of what you are addressing could easily make nerve symptoms worse due to mechanical aggravation of the nerve. That is exactly why having a solid understanding of many nerve-related disorders will make you a far more successful clinician.